In the latest alpha release of React, a new concept was introduced, it is called Hooks. Hooks were introduced to React to solve many problems as explained in the introduction to Hooks session however, it primarily serves as an alternative for classes. With Hooks, we can create functional components that uses state and lifecycle methods. Hooks are relatively new, as matter of fact, it is still a feature proposal. However, it is available for use at the moment if you&apos;d like to play with it and have a closer look at what it offers. Hooks are currently available in React v16.7.0-alpha. It&apos;s important to note that there are no plans to ditch classes. React Hooks just give us another way to write React. And that&apos;s a good thing! Given that Hooks are still new, many developers are yet to grasp its concepts or understand how to apply it in their existing React applications or even in creating new React apps. 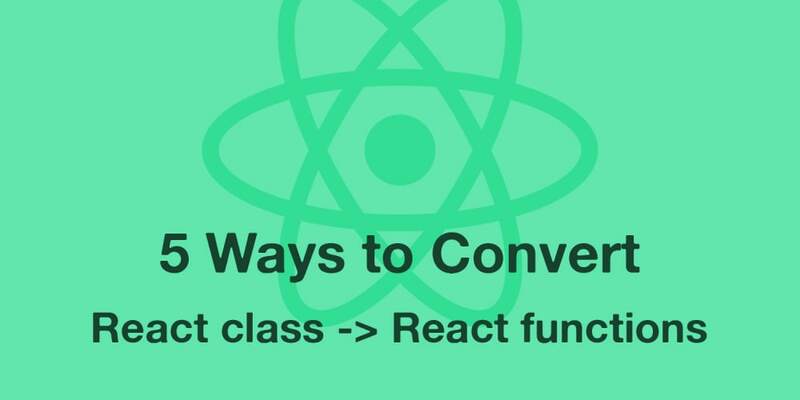 In this post, we&apos;ll demonstrate 5 simple way to convert React Class Components to Functional Components using React Hooks. Like the class component we had earlier, there&apos;s nothing new or unusual here. We haven&apos;t even used Hooks or anything new as of yet. This is because we&apos;ve only considered an example where we have no need for state or lifecycle. But let&apos;s change that now and look at situations where we have a class based component with state and see how to convert it to a functional component using Hooks. Here, name is the equivalent of this.state in a normal class components while setName is the equivalent of this.setState . The last thing to understand while using the useState() Hook is that it takes an argument that serves as the initial value of the state. Simply put, the useState() argument is the initial value of the state. In our case, we set it to "John Doe" such that the initial state of the name in state is John Doe. This is primarily how to convert a class based React component with state to a functional component using Hooks. There are a lot more other useful ways of doing this as we&apos;ll see in subsequent examples. This demonstrates how we can convert a class based component with multiple state properties to a functional component using the useState() Hook. Here&apos;s the Codesandbox for this example. Let&apos;s consider a class with only state and componentDidMount. To demonstrate such a class, let&apos;s create a scenario where we set an initial state for the three input fields and have them all update to a different set of values after 5 seconds. To achieve this, we&apos;ll have to declare an initial state value for the input fields and implement a componentDidMount() lifecycle method that will run after the initial render to update the state values. When the app runs, the input fields will have the intial values we&apos;ve defined in the state object. These values will then update to the values we&apos;ve define inside the componentDidMount() method after 5 seconds. Now, let&apos;s convert this class to a functional component using the React useState and useEffect Hooks. This component does exactly the same thing as the previous one. The only difference is that instead of using the conventional state object and componentDidMount() lifecycle method as we did in the class component, here, we used the useState and useEffect Hooks. Here&apos;s a Codesanbox for this example. Next, let&apos;s look at a React class with state and two lifecycle methods. So far you may have noticed that we&apos;ve mostly been working with the useState Hook. In this example, let&apos;s pay more attention to the useEffect Hook. At this point, when the app runs, it starts with the initial header This is a Class Component and changes to Welcome to React Hooks after 3 seconds. This is the classic componentDidMount() behaviour since it runs after the render function is executed successfully. Here, we have state, componentDidMount() and componentDidUpdate() . So far when you run the app, the header updates to Welcome to React Hooks after 3 seconds as we defined in componentDidMount(). Then when you start typing in the header text input field, the <h3> text will update with the input text as defined in the componentDidUpdate() method. Now lets convert this class to a functional component with the useEffect() Hook. We&apos;ve achieved exactly the same functionailty using the useEffect() Hook. It&apos;s even better or cleaner as some would say because here, we didn&apos;t have to write separate codes for componentDidMount() and componentDidUpdate(). With the useEffect() Hook, we are able to achieve both functions. This is because by default, useEffect() runs both after the initial render and after every subsequent update. Check out this example on this CodeSandbox. React PureComponent works in a similar manner to Component. The major difference between them is that React.Component doesn’t implement the shouldComponentUpdate() lifecycle method while React.PureComponent implements it. If your application&apos;s render() function renders the same result given the same props and state, you can use React.PureComponent for a performance boost in some cases. The same thing applies to React.memo(). While the former refers to class based componentrs, React memo refers to functional components such that when your function component renders the same result given the same props, you can wrap it in a call to React.memo() to enhance performance. Using PureComponent and React.memo() gives React applications a considerable increase in performance as it reduces the number of render operations in the app. When you run the app and check the logs, you&apos;ll notice that it renders the component every 2 seconds without any change in state or props. As terrible as it is, this is exactly the scenario we wanted to create so we can show you how to fix it with both PureComponent and React.memo(). This achieves the same result as PureComponent did. Hence, the component only renders after the initial render and doesn&apos;t re-render again until there&apos;s a change in state or props. Here&apos;s the Codesandbox for this example. React Hooks is still a feature proposal, however, we are hoping that it will be part of the next stable release as it makes it possible for us to eat our cake (use state in function components) and still have it back (retain the simplicity of writing functional components).